Your bankruptcy case should never close without a discharge. To prevent this from happening, you must complete a two hour financial management course at some time after your case is filed and prior to discharge. This gives you a window of approximately three months to complete the financial management course. 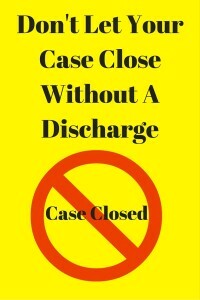 If you fail to do so, your case will close without a discharge. At that point, creditors are free to pursue collection efforts against you until such time that you bring a motion to reopen the case, to allow for the filing of a financial management certificate and subsequent case closing. This motion to reopen is accompanied by a filing fee of $260 as well as a typical attorney fee which ranges from $200-$800. This is all an unnecessary expense and exercise which could be prevented if the financial management course is taken in good order. I direct all of my clients to take the financial management course online. In the comfort of a home, an office, a library, or any other place where the Internet is accessible, a person can complete the two hour financial management course and get it done. There is also a short quiz which must be completed after the course is viewed. The quiz is not difficult and simply ensures that the person actually watched the video and understood a portion of it. The two hour financial management course is one of those requirements that Congress put in place in the hopes that people who had to file a bankruptcy case would become financially educated so that in the future they could avoid filing for bankruptcy. While most people have found the course to be a hurdle to jump over, there are some individuals who do find the course beneficial in that they did not have this type of financial education growing up. For those individuals, the course is well worth their time. For others who are educated in financial matters, the course is a two hour exercise. For most people, they understand at this point what caused their financial issues and have made significant improvements in that regard. For example, someone who was overwhelmed with credit card debt knows to be more cautious in the future with regard to unsecured credit. For someone who was hurt with uncovered medical bills, that person now knows the value of medical insurance and they will hopefully obtain it under the Affordable Care Act. For others, it may be divorce, illness, injury or other life-threatening situation which led to extreme debt. There is no two hour course that could prevent certain events in life. However, the course is required and it must be completed before a case closes without a discharge. If you are uncertain where to take the course, you should contact your attorney. If you filed pro se, you can contact the United States Bankruptcy Court for the district in which you live or you may contact the United States Trustee for a listing of approved financial management providers. Help is available for those that need it. Please don’t ignore the requirements lest your case will close without a discharge and creditors will be back at your door in efforts to collect on debts.